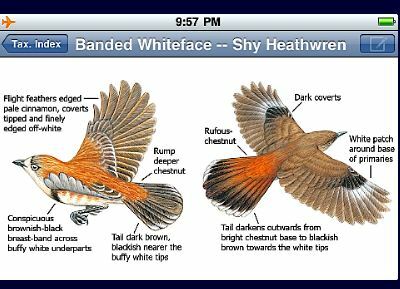 For Apple iPhone and iPad and iPod Touch; now also for Android "smartphones" , Australia's first fully interactive electronic bird guide includes all the paper book's approximate 3000 illustrations, plus several thousand bird calls, all at lower cost than the paper book alone. iPhone optimised controls ­ swipe to next or previous species, one-tap enlargement of an image and rotate the device (landscape) to enlarge an image completely (and fit the width of the screen). Over 3000 hi-res bird images covering over 790 bird species. Most bird species have a detailed distribution map showing any subspecies that occur. Also descriptions of almost all bird species including songs and calls, measurements and breeding behaviour. 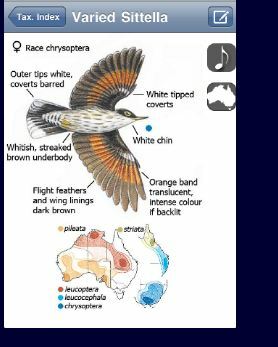 A Smart Search that gives the ability to search by distinguishing features such as size, colour, physical features, habitat and exclude certain types of birds (eg. Passerines). Taxonomic and Alphabetic searches are the most direct and simple way to find any bird species. But you must either know the common or scientific name of the bird, or look throught the bird list, perhaps up to 800, in hope of recognizing the bird you have seen. 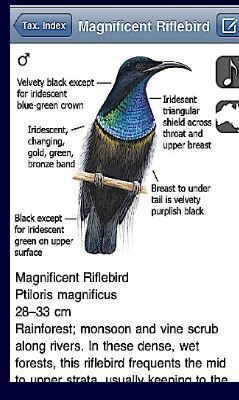 The "Smart Search" feature, where the observer of a bird may select physical features such as long bill long legs, upcurved or downcurved bill. This futher shortens the list of possible names for the bird. Likewise the colours of its pumage, the habitat, and the size. Future editions will bring in other search criteria to further refine and close in on the identity of the species. Also from the Main Menu can be chosen My List, for recording sightings, and at the top right hand corner, access to the Introduction, under which heading are sub-menus for Help, Introduction, Acknowledgements, and Copyright . The "My Location" menu allows the user to choose one of twenty regions, thirteen land and seven surrounding seas. With one of these selected, all searches are confined to that region. The region choice limits the search for the species, to that region. This applies to all searches, Taxonomic, Alphabetic, and the Smart Search. On this screen, above the map, the user can also choose "Usual" to limit the search to those species birds usually in the region, or "All" to include also the rare and vagrant species, or pick "Vagrant" to search only among only the rare vagrant, stormblown and sometimes slightly doubtful records. 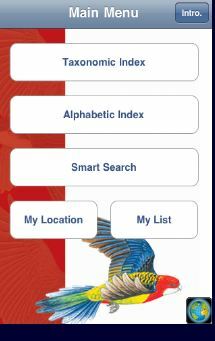 When any bird species is displayed, whether found by taxonomic, alphabetic or 'Smart' search routes, the first screen (right) will show in its top 2/3, the illustrations . These can be scrolled upwards to display illustrations and their identifying markings. The bottom 1/3 displays the text, which scrolls upwards. A tap om either art or text expans that part to full screen. At top right, to right of species name, is a notebook-pen symbol, which takes user into pageswhere sightings can be recorded. When the music note symbol at top right of screen is touched, the song selector appears, with a selection of calls and songs displayed. When the "Compare" feature is in use, its easy to switch between calls of any two species or races, and to the illustrations. 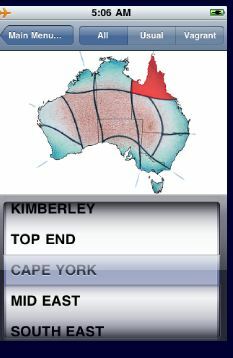 When the map symbol near the top right-hand corner is tapped, the text is relaced by the map for the species. The bird images can be scrolled vertically, sothat that each illustratied race can be viewed above the map. AT RIGHT In the Compare mode ("Comp" ) any two species can be compared on the screen,.eg both males together, . or both females, or bth in both breeding plumages, both maps, both sets of songs. The species in the lower half remains fixed, while many differnt species can be scrolled across the upper half to compare with the lower species. BELOW Whether viewing a single species, or comparing, the iPhone can be turned on it side for an enlarged view. This is but a short summary of the features of this application. Other abilities will be added in future upgrades, usually free. .Many new maps to better display range, include new boundaries, or take in range updates. This App is, to end of December 2011, is available for "Smartphones"using Google's Android OS, and for Apple iPhone, iPod Touch and iPad. 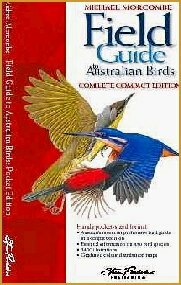 Since 2000: a most comprehensive Australian guide despite its compact 'pocket' size.....over 800 species covered, including sub-species (races), many of which are more distinctive than others thatare full species. Some have in the past been classified as species, and retainwidely recognized common names. 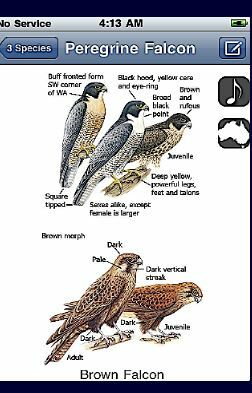 This is most comprehensive of all guides for identification of these interesting variations. Across the great distances and varied of habitats many species show variations of plumage, song and behavior tthat may lead in time to evolution of new species, as has occurred in the past. Unique multi-coloured maps show the distribution of both species and subspecies, as well as approximate frequency of sightings. This smaller format guide has been created in response to many requests for a smaller "pocket" version. 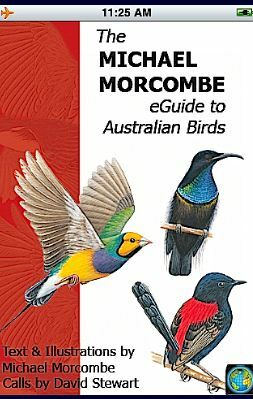 the original guide has larger page size, greater weight, but includes the nests and eggs, and the birds of Australia;s island territories. The author reserves the right to vary, modify, reduce extent, restrict access to part or whole, or discontinue this web site at any time without notice or warning.